In the American Journal of Public Health this month, Jennifer Falbe and colleagues found that the penny-per-ounce Berkeley soda tax succeeded in reducing sugar-sweetened beverage (SSB) consumption. The study asked respondents about soda intake, in Berkeley and in comparison cities of northern California (Oakland and San Francisco, which did not have a new tax), before and after the new Berkeley tax was implemented in March 2015. The findings were remarkable. SSB consumption fell 21% in Berkeley and rose 4% in the comparison cities during the same period. The SSBs include caloric soda, of course, but also some kinds of other sweetened drinks. However, for various reasons (including sound nutrition reasons plus perhaps political reasons), the tax did not affect milk drinks or 100% fruit juice. Therefore, it is important to understand what other beverages people substituted for soda. The study does not answer all my questions on this point, but it did find that water consumption increased in Berkeley at the same time that SSB consumption fell. Water consumption increased 63% in Berkeley, significantly more than the increase in the comparison cities during the same period. This was reassuring. A good way to standardize estimates of tax effects is to report an "elasticity" -- the percentage change in consumption for each 1% change in price. A typical elasticity estimate for soda is about -1.2, meaning that the price increase in Berkeley (about 8%) would have been expected to generate a consumption decline of about 10%. The authors took care to confirm that the estimated consumption decline of 21% was significantly different from zero, which is the standard statistical way of making sure the estimates were not a random statistical fluke, but they cannot really be sure the true impact is exactly 21% rather than 10%. They sensibly discussed the possibility that "early reaction to the tax ... could rebound and settle closer to a 10% reduction in consumption." Even if the impact were a 10% reduction, this study has important public health implications, providing I think the strongest evidence so far that a tax would reduce SSB consumption. I encourage my colleagues in agricultural and applied economics to read this study. There is a long tradition in my profession of doubting the potential impact of such taxes. In the Washington Post in 2015, Tamar Haspel quoted University of Minnesota applied economist Marc Bellemare saying the results at that time were "not robust." Haspel also quoted my Friedman School colleague and friend Sean Cash saying that product formulation, rather than taxes, are the way to go: "If we could achieve a 5 percent reduction by reformulation, that would swamp what we can achieve with consumer-level intervention.” The TuftsNOW site quoted Sean casting further doubt on taxes: "All studies suggest that for food in general, we’re not particularly responsive to price." Oklahoma State University economist Jayson Lusk, who also is president of the Agricultural and Applied Economics Association (AAEA), has blogged several times about soda taxes, agreeing with most of the Tamar Haspel column in the Washington Post, and concluding stridently: "I'm sorry, but if my choice is between nothing and a policy that is paternalistic, regressive, will create economic distortions and deadweight loss, and is unlikely to have any significant effects on public health, I choose nothing" (emphasis added). In the Salt this week, NPR reporter Dan Charles quotes Berkeley researcher Kristine Madsen on whether the new estimates of SSB reduction are large enough to matter for public health. "Madsen says a 20 percent reduction in consumption of sugar-sweetened beverages would be enough to reduce rates of obesity and Type 2 diabetes in years to come. 'This would have a huge public health impact if it were sustained,' she says." I think most experts in public health nutrition would agree with Madsen's assessment. This week, Jayson's blog post on the Berkeley study raises some measurement issues, but recognizes that these issues are unlikely to overturn the main result. He writes, "All that said, I'm more than willing to accept the finding that the Berkeley city soda tax caused soda consumption to fall. The much more difficult question is: are Berkeley residents better off?" This is a question that surely will be discussed heavily in the next couple years as more municipalities experiment with such policies. Harry Kaiser (Cornell University) and I have enjoyed putting together a lively session later today, discussing the question: Are checkoff programs good for nutrition? In a friendly debate, Harry will argue "yea" and I will argue "nay" (though in fact we agree on many aspects of these programs). John Crespi from Iowa State will be independent discussant, and Kristin Kiesel of UC Davis will moderate. 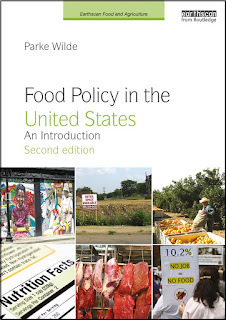 The session takes place in the Berkeley room 2:45pm today, Aug 2, at the conference site for the Agricultural and Applied Economics Association (AAEA) here in Boston. Harry was one of my professors in graduate school at Cornell in the 1990s, and he is a leading economist in the evaluation of generic advertising effects on food consumption. 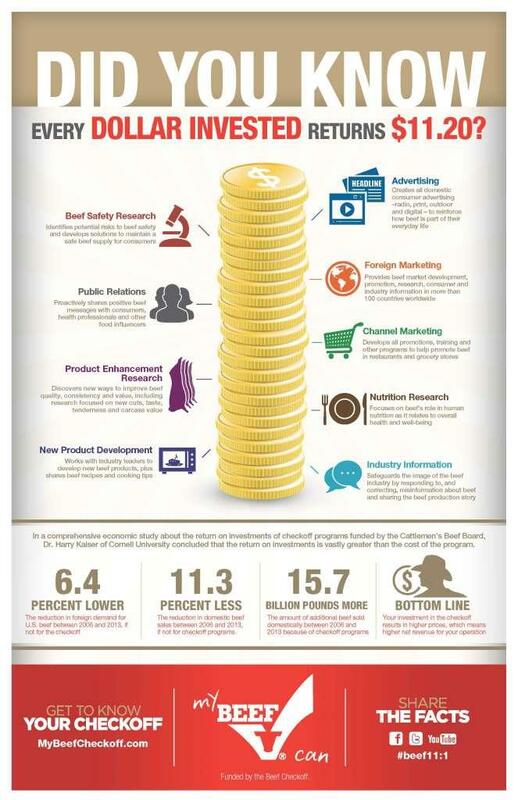 This recent infographic from the beef checkoff program highlights his work (click for full size).